The screening is very much open to all and we are encouraging staff and students to bring their friends and families to make the most of the atmosphere. There will be additional seating. 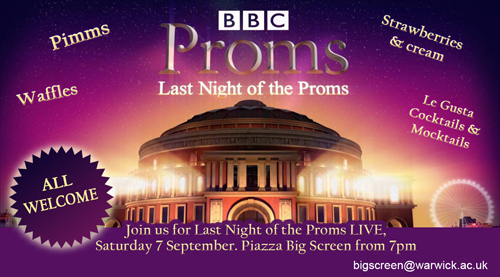 Food and drinks will be serving from 7pm ready for the start of the concert and we will be featuring highlights from previous Proms concerts beforehand.. In addition to this, you are welcome to bring picnics, rugs, flags, silly hats and anything else you would like to create our own Last Night of the Proms Party.